19 hour challenge that spawned SpaceOreMiner but slightly more concentrated – complete an entire game in a weekend. On Thursday night I came up with a simple prototype idea for a cell based game. Clearing as much of my weekend as I could, I set to work coding a game based upon this prototype idea. The goal was simple : I wanted a playable game, with sounds and music, as well as non-place holder artwork and a menu screen. One of the things I had to avoid a lot during this process was feature creep. It was so tempting to fall into the ‘lets add everything and make it awesome’. But I knew if I realistically wanted to complete a game within the weekend, I had to keep everything as simple as possible. But, to be honest, for around 12 hours work, I think I have something that fulfills all my major goals within my allotted time frame. There is plenty I will add and change to Slime Dungeon in the coming weeks ( it says version 1.0 but probably a good idea to take 0.99 off that value 😉 ). One of the most important of these being an option screen. The music is great and all, but gets annoying after a while 😉 Secondly the AI REALLY needs beefing up – currently it just randomly picks squares and tries to group it’s slimes together. There are some minor ( non-game play altering ) bugs also that need squashing. Thanks go out to Inko, who provided the amazing slime model and animations ( also an upgrade that is needed, he has provided three animations in total with it but time-constraints have prevented me from implementing them this weekend). I’d also like to mention freesound.org for the fantastic slime sounds and also the incredible offering of No Soap Radio which provided both the music pieces to the game. If you are an indie developer, I’d really recommend checking them out! Fringe Planet is an exciting survival simulator game I'm working on full time. Please feel free to check it at fringeplanetgame.com. This blog is the personal blog of Nic Rutherford, a game developer from the UK - my views are strictly my own. I hope you enjoy reading! 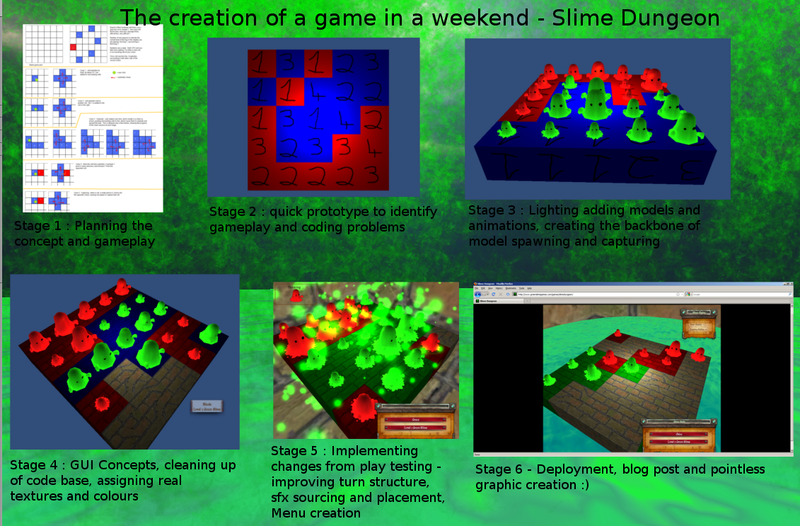 GreenSlimeGames by Themebuilder | Entries (RSS) and Comments (RSS) and Sitemap.